Equisetum, originally thought to be a gold hyperaccumulator but other evidence suggests not. Perhaps the most obvious plants to write about are the numerous species with gold (aurea and its forms) in their names. These range from Abrus aureus, a climbing vine in the pea family that is native only to Madagascar, to Zizia aurea or “Golden Alexander”, a yellow flowered member of the carrot family native to north America, however this is not the most interesting story of gold to be reported by far. Several plant species are able to accumulate metals, some in quite high concentrations by accumulation from the soil. This process is known as phytomining and can be the most cost effective way of concentrating low levels of heavy metals from soil. A major report by the US geological survey in 1968, Metal Absorption by Equisetum (Horsetail), suggested that reports of horsetail (Equisetum) accumulating high levels of gold from the environment were questionable although it did contain some gold. A later report USGS 1970 covered the topic more generally in “Absorption of Gold by Plants“. Other plants have been shown to accumulate a range of metals including Gold, prominent among these are members of the cabbage family (Brassicaceae). Several members of Brassicaceae are known to accumulate heavy metals including lead as well as gold. Recently it has been shown that the gold is stored as nanoparticles in plant cells. The growing of metal accumulating plants on polluted soils and the subsequent accumulation of metals can be important in cleaning up these soils, so-called phytoremediation and phytoextraction. 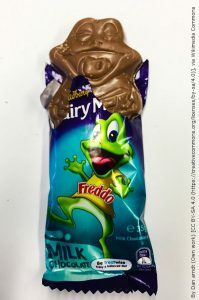 Freddo – but not the gold deposit. So whether you want real gold from hyperaccumulators or are happy with gold coloured plants there is a range of species to cater for your needs. This entry was posted in Advent, Herbarium RNG, Public Engagement with Science and tagged #AdventBotany, Equisetum, Gold, hyperaccumulator, phytoextraction. Bookmark the permalink.